Gypsy Woman: With her home on wheels, Bei can "open the backdoor and listen to the coyotes yipping." In a town where working stiffs rent live-in tool sheds and even the smallest house is worth a million dollars, finding places that are affordable and livable is a challenge that requires equal degrees of artistry and inventiveness at ever increasing levels. Take the case of potter and healer Ishana Bei, who ended up finding a three-part solution for her living and working needs. 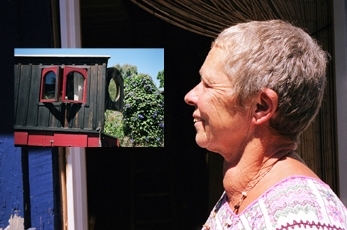 "It's a triad," says Bei of her unique solution, which involves a space in the mountains where she makes her pottery, a studio close to downtown where she displays her wares and does her energy work, and what she calls a "gypsy wagon on wheels," a converted flatbed truck where she sleeps at night and which features brown wood, barn red paint, latticed windows and a portal in the backdoor. Showing me around her airy downtown studio, which sits a stone's throw away from Mission Street at Highway 1, it's hard to believe this was once a rundown dump. Wind chimes go off on a light breeze, and Gunga Din, the neighborhood orange and white feral cat, peeks through a tangle of orange nasturtium vines, as Bei leads me through bamboo hanging curtains and into a display space, where potbellied bowls line the shelves and fat-bottomed gourds hang from whitewashed walls. "I don't decorate places," says Bei, who likes to dress in embroidered tunics from South America. "I just place things that I need and that bring clarity and wisdom to a space, and make its energy clear, and let the eyes run freely. A leaf here, a feather there. And I use all my baskets, bowls and gourds. To her mind, the way we create our inner space is what manifests itself in our outside space. "It's a matter of seeing what you have to do, not only to make a place beautiful, but also to make it work, so I always clear the energy wherever I go," says Bei, whose studio is surprisingly bright, the light lifted by the burnt orange, beige and brown earth tones in the Persian carpet, the South American rug and the collection of embroidered huipil pillows from Mexico, Guatemala and Peru. She sits down in her rocking chair, which is flanked by a wood burning stove on her left, and a cupboard on her right, a wooden affair which Bei made from a box in which a friend reportedly received Henry Moore's elephant skull sculpture. A ladder made of gnarled bamboo leads to a loft above her head. "Santa Cruz is crowded and full of tight living spaces," observes Bei, who played the drum here until the neighbors complained. "Now I take my djembe to the beach," says Bei, who has created a haven outside her studio with bamboo and greenery, to have some privacy. "Otherwise, I was finding myself talking on my mobile phone right outside my landlady's bedroom." A practitioner of the Yuen method of Chinese Energetics, which claims to "clear the root-cause issues on the quantum level," Bei installed all the windows and floors in her studio, an effort she considers worthwhile becauseit gave her exhibit space. I like to travel light," says Bei, who spends the night in her Gypsy wagon, something she's been doing since 1977. "I've traveled across Colorado, Montana and New Mexico in it. At old towns, at gas stations, people love my truck. As long as you aren't unkempt and unwashed, they work with you," says Bei, who has also lived in it in Big Sur. "I'm not bound to tiny spaces, because I can always open the backdoor and listen to the coyotes yipping. I live in the wilderness for two weeks at a time, and see otters, bald eagles, herons and turtles in the river. I can step out of my wagon and it becomes my little den. "I can touch the earth, have my feet in the water and connect with the people. I have really good experiences. And I can go to West Cliff, back my wagon in and have a million-dollar view without paying taxes! I like to be a part of the community. I like to say hello to people, instead of turning away from them." From the August 17-24, 2005 issue of Metro Santa Cruz.